When you want to exude your individual sense of style without compromising on quality and comfort, you need a pair of stylish exotic skin shoes for men. Handmade leather shoes crafted from premium animal skins sets you apart from the crowd, with a luster, texture and finishing that is simply unmatched. Explore our collection of the finest exotic skin shoes from around the world and upgrade your wardrobe today. You could say exotics are the best of the best for the man with the most exquisite taste in luxury designer footwear. We have exotics from brands like Mezlan, Mauri, Fennix, and more. If you’re looking for exotic ostrich, deer, alligator, crocodile skins then we’ve most likely got it. At Arrowsmith Shoes, we take care to ensure that each pair of exotic skin shoes listed here comes with the promise of authenticity. Some of the exotic skin shoes for men that are praised by fashion bloggers and endorsed by celebrities include lizard skin shoes with rounded scales, unique python skin footwear, and shoes crafted from rare ostrich skin with quill. You won’t find a larger collection of rare exotic skin shoes anywhere online. Over the past few decades, exotic skin shoes for men have undergone an evolution, entering mainstream fashion and leading the way for progressive men’s style. As a result, the unique traits that lovers of animal skin shoes desire have been complemented with more durable designs and higher quality craftsmanship. We’re proud to source our exotic skin shoes from the best brands in the world, including Mauri of Italy, Belvedere, and Vestigium. Wearing exotic skin shoes is about making a fashion statement – one that emphasizes decadence and luxury. That’s why we curate our collection of exotic skin shoes for men with an eye on brands that maintain the highest standards for quality and authenticity. 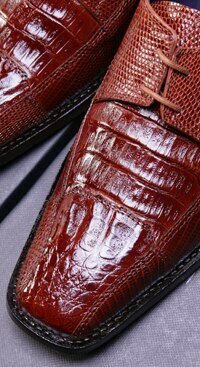 If you have any questions about our exotic skin shoes, send our team a message. Whether you are scouting for retro-looking exotic shoes, sophisticated dress shoes, chic casual shoes, or artsy shoes made from rare animal skins, you will definitely find a pair that suits your style at Arrowsmith Shoes.